Before the Big Bang: A Twin Universe? The new study suggests that the universe that came before our own universe was its identical twin. Image credit: NASA and ESA. Until very recently, asking what happened at or before the Big Bang was considered by physicists to be a religious question. General relativity theory just doesn’t go there – at T=0, it spews out zeros, infinities, and errors – and so the question didn’t make sense from a scientific view. But in the past few years, a new theory called Loop Quantum Gravity (LQG) has emerged. The theory suggests the possibility of a “quantum bounce,” where our universe stems from the collapse of a previous universe. Yet what that previous universe looked like was still beyond answering. Now, physicists Alejandro Corichi from Universidad Nacional Autónoma de México and Parampreet Singh from the Perimeter Institute for Theoretical Physics in Ontario have developed a simplified LQG model that gives an intriguing answer: a pre-Big Bang universe might have looked a lot like ours. Their study will appear in an upcoming issue of Physical Review Letters. But Corichi and Singh have modified the simplified LQG theory further by approximating a key equation called the quantum constraint. Using their version, called sLQG, the researchers show that the relative fluctuations of volume and momentum in the pre-bounce universe are conserved across the bounce. That means that our universe today, roughly 13.7 billion years after the bounce, would share many of the same properties of the pre-bounce universe at 13.7 billion years before the bounce. In a sense, our universe has a mirror image of itself, with the Big Bang (or bounce) as the line of symmetry. Specifically, Corichi and Singh calculate that the change in relative fluctuations across the bounce is less than 10-56, a number which becomes even smaller for universes that grow larger than 1 megaparsec (our universe is somewhere between 3,000 and 6,000 megaparsecs). As the researchers explain, having an identical twin universe would not necessarily mean that every single feature of both universes would be identical. For instance, it doesn’t imply that there was another you that existed at some point, a person who has already lived your life. “If one were able to look at certain microscopic properties with a very strong microscope – a very high-energy experiment probing the Planck scale – one might see differences in some quantities, just as one might see that twins have different fingerprints or one has a mole and the other does not, or a different DNA,” Singh said. As Singh explained, there are still many questions regarding the details of the possible pre-bounce universe. Ultimately, Corichi and Singh’s model might even tell us what a future universe would look like. Depending on how fast our present universe is accelerating – which will ultimately determine its fate – there’s a possibility that a generalization of the model would predict a re-collapse of our own universe. More information: Corichi, Alejandro, and Singh, Parampreet. “Quantum bounce and cosmic recall.” Arxiv:0710.4543v2. Accepted for publication in Physical Review Letters. Um. Two words: measurable predictions. How is this theory different from the Big Bang --> Great Collapse --> Big Bang theory? The Universe is infinite and the only non-possibility is no possibility at all. "Rabble, rabble, rabble - Non-sense!" shout the geniuses and intellectuals, "It simple isn't possible for the Universe to be infinite because of such and such a law and formula and perspective! We can SEE the edge of the Universe! How foolish you are earls to simply ASSUME!" If you can imagine something, it can be made real. And the only thing I can't imagine is nothing at all. But congratulations to the team for making their assumptions fit an equation. >"The significance of this concept is that it answers what happened to the universe before the Big Bang,"
It doesnt answer anything, its just some wild speculation based on approximate equations of a simplified version of one of many proposed theories of quantum gravity which was unable so far to provide any testable hypothesis. Maybe the first one was the real earth and we are the heaven? near non-existence. At that point a gravity loop is left and from the gravity loop the big bang. I would be willing to bet that there would be some radiation left. Probably similar to the background radiation left by the big bang itself. It is difficult to understand the concept of time, but the twin universe is our universe with time perceived moving backwards. Time is a looped dimension. For our perception, we move forward in time, but it is only a perception. We are unable to distinguish if we would be moving backwards in time. Time itself doesn't move anywhere. Our universe exists in every point of time, we just can't see it, since we all stuck in the same time frame. At some point we will reach the opposite point from the big bang and time will stop for us. We will not even notice. The universe will play the history backwards and shrink back into singularity at the time of the big bang.. and everything will repeat itself. Consider the idea that this universe is a virtual reality. In addition to those arguments, one way to explain the apparent fact that space and time and mass and energy are quantized would be to say that their quantization is a result of the fact that the 3-D monitor, in which our virtual reality is displayed, has a finite spatial screen resolution, and a finite repetition rate. So if this universe is a virtual reality, we need to ask the originator of this virtual reality, yes? The laws of physics say that energy must be conserved and momentum must be conserved. From the point of the big bang on, matter has conserved its momentum by expanding outward. But before the big bang, there must still have been energy because energy is conserved. I don't know why all the energy of the universe would stay still (in one spot) for half of an eternity and then explode outward. It seems to me that there must have been a previous collapse of energy that brought it all to one point. Just pick a random universe with random boundary conditions. Wow congratulations to this "scientist". He figured out what I stumbled upon in the sixth grade. Not all the math but the general idea. Things are born, get old, then die, and are reborn, ware have I heard that before? All this about the last universe being just like this one is crap too. Tweak any set of variables such as mass or collapse velocity and it would look completely different without changing the result. What happened before the big bang can never really be proven, this makes it a matter of faith not science. Science is based on provable fact not useless speculation. The Universe is INFINITE. There is NO EDGE - it just keeps going. It has no beginning, it has always been. It has no end, it will always be. The ARROGANCE of all of the scientists assumes that WE ARE IN THE CENTER OF THE UNIVERSE. We are not. There is no center, it is infinite. If we had a big bang on our salt speck it would have no effect on the salt speck off the coast of Japan. In many ways, we are still applying scientific thought as if we were in the days of Galileo and Copernicus - when will science figure out we are not at the center of the universe? 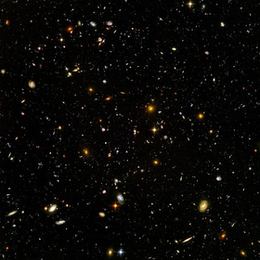 What make you believe in we are assumed the "center" of universe in science? We are already in 21st century, man. The arrogance is in you, not the scientists. And mind you, while our universe were found no edge, that doesn't mean the universe is infinitely large. The space can warp just like the earth is round. The ground we stand on has no end but nontheless a limited area. Same as our universe. Wouldn't this create another Information Paradox? I know that's meant to be applied to Black Holes, but the same basic idea seems to apply. "There is a theory that states that is ever anyone discovers exactly what the Universe is for and why it is here, it will instantly disappear and be replaced by something even more bizarre and inexplicable." > The Universe is INFINITE. No, the universe is finite, but unbounded. Yes, thanks, we all know what the textbook says. If this study and our subsequent comments don't reek of religion, nothing does. Most (not all) are passionate statements of belief with absolutely no proof. er... correction required? The authors seem to have lost a very large slice of our universe. So .. start working on a way to preserve information past the crunch. And as this probably isn't the 1st time, chances are when you find some method that will work, you will find a message already waiting. I got this site in the first place to learn about such. Turtles all the way down is what we have in that the law of conservation forces us to conclude that there is eternal Existence, however the number of universes. It is a matter of vacuum fluctuation energy. I have had a "stringless string theory" that nobody has given me any feedback on. I hope that this theory will bridge the gap between Relativity and Quantum. I try to make everything compatible with the former, but, since I never really understood the latter, I can just hope. Simply put, there are the three large spatial dimensions that we are familiar with, a number of small dimensions (probably six), plus time, which acts like an imaginary (in the sense of the square root of -1) dimension. Thus we may have 9 i dimensions. The spatial dimensions vibrate or pulsate, getting repeatedly bigger and smaller. For the big dimensions, the period is billions or trillions of years; for the small dimensions, maybe yoctoseconds, or even shorter. What should I call this? Pulsating Yocto-Dimensions Theory (PYDT). There is also a rule that every closed region of space, the hypervolume is constant. If one dimension gets larger, another must get smaller to compensate. The combined effect of the (assumed sinusoidal) pulsations of the small dimensions is to dilate the large dimensions, leading directly to Einsteinian Gravity, and eliminating the need for Gravitons or Higgs Bosons. The overall intensity of the small-dimension pulsations (energy) leads to gravity, and, by applying Einstein's Equivalence Principle, mass. These vibrations or pulsations always travel at the speed of light. If all the motion is in the small dimensions, then you have a stationery particle. If all the motion is in the large dimensions, then you have a "massless" particle like a photon. A moving massive particle moves in both the large and small dimensions (or more properly, moves in the large dimensions and pulsates in the small dimensions), providing a novel explanation of time dilation that is not inconsistent with Minkowski's. Now, there must be some sort of resonance between pulsations in different small dimensions in order to explain quantum effects. Perhaps the differences in phase between pulsations in different dimensions explains the various different non-gravitational forces of nature. I believe that Gravity is different, and is inherently non-quantum. If there are many Universes in the Multiverse, they all would have gravity, but their Quantized forces could be different. Also, the Big Bang might have been when three of the previous small dimensions became our large dimensions, while the previous large dimensions became small dimensions. This is just a nutshell outline. Correction: Not "9 i" dimensions, but "9 i" dimensions. OK, this seems to ignore plus signs. Where it says "9 i" dimensions, I mean "Nine plus eye", that is, the sum of three squared plus the square root of negative one. I just want to raise another possibility -- as the large dimensions expand, the small (yocto) dimensions might be getting smaller, slowly changing the laws of physics. The observations of conditions from many billion of years ago might be skewed because the constants of physics may have been different back then, so inflation might be an illusion. I can speculate on much cooler things with no supporting evidence. Before the Twin Universe: A Big Bang? I like to think that the universe eventually collapses in on itself which creates a big bang that starts the cycle of existence over again.